Some of you sometimes think why your application eat up until 1 GB-2GB memory on production server. After looking through the code, doing some profiling, maybe shaking your head a bit, you've figured out what the issue is and now you need to give some feedback. In this tutorial, I will show some tips that you can follow to reduce your memory usage on production server and keep your ASP.NET MVC codebase working as you’d expect. The root cause of the support ticket I received was a simple case of fetching too much data from the database, causing obscene amounts of memory usage. It's a common enough issue. You're building a simple blog, it has posts and it has media (images, videos, attachments). You put a Media array onto your Post domain object. Your Media domain object has all the image data stored in a byte array. Since you're using an ORM, there's a certain way you need to design your domain model to play nice; we've all experienced this. A seemingly innocuous line (unless you've been bitten), a sneaky monster is lying in wait with big consequences if you haven't disabled lazy loading or didn't tell your ORM to ignore that big Data property on blog media. It's important to understand how your ORM queries and maps objects and make sure you only query what you need (for example using projection). 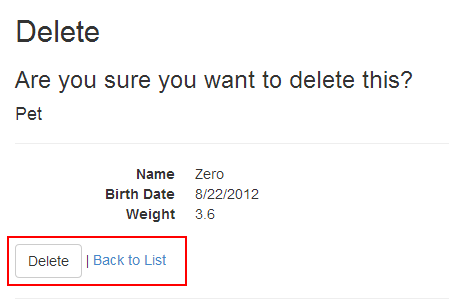 This ensures we only grab the amount of data we really need for the task. It's OK to have more than 5 methods on a repository; be as granular as you need to be for your UI. Your "view model" has business logic in it on top of calling a data access method directly. Now you've introduced data access code somewhere it doesn't belong and hidden it inside a property. Move that into the controller so you can wrangle it in and populate the view model conciously. This is a good opportunity to point out that implementing proper unit tests would uncover issues like this; because you definitely can't intercept calls to something like that and then you'd realize injecting a repository into a view model is probably not something you want to be doing. Putting business logic in the view is a no-no, but on top of that you're creating acontroller! Move that into your action method and use that view model you made for what it's intended for. You can also move that logic into a separate action method that only gets called inside views so you can cache it separately if needed. Any method that is marked with ChildActionOnlyAttribute can be called only with the Action or RenderAction HTML extension methods. This means people can't see your child action by manipulating the URL (if you're using the default route). 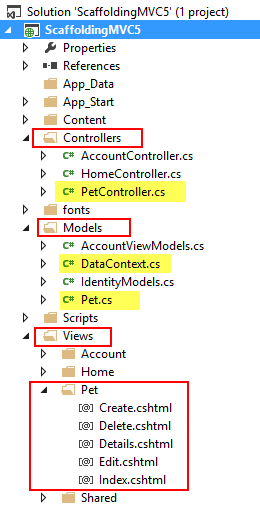 Partial views and child actions are useful tools in the MVC arsenal; use them to your advantage! Given the code smells above, what do you think will happen if you only cached your view model? Nothing! There will not be any performance gain because you're accessing the data layer through a controller variable in the view and through a property in the view model... caching the view model won't help anything. Notice the handy OutputCache attribute. MVC supports ASP.NET Output Caching; use it to your advantage when it applies. If you are going to cache the model, your model needs to essentially be a POCO with automatic (and read-only) properties... not something that calls other repository methods. I hope with tutorial above, it will help you to minimize your memory usage on the server. Today, I will show you How to Easily Add ASP.NET MVC 5 Anti-Forgery Tokens to any or all Post Requests. One of the newer attacks against web applications is that the cross-site request forgery attack. It’s an attack against modern applications that store a cookie to represent the presently logged in user. The matter has been explained in different websites. One of the techniques to stop this attack is to add an anti-forgery token using the @Html.AntiForgeryToken extension technique. On the controller side, the action technique defines the [ValidateAntiForgeryToken] attribute. Behind the scenes, the hidden input field for the anti-forgery token is valid by the ASP.NET MVC 5 framework to confirm it’s correct. Whereas there's discussion as to whether or not this approach is required only for the logging in an anonymous posts, or all posts in general, as been up for debate. However the purpose of CSRF is to attack authenticated users. 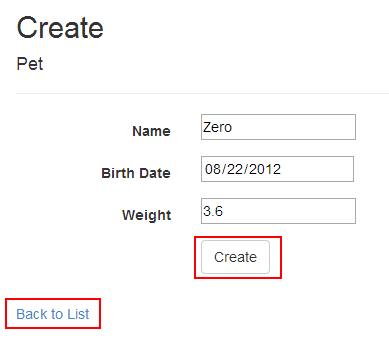 If we use our custom helper for all of our forms, then all of our custom forms can have rendered an anti-forgery token. so we don’t have to worry about making it ourselves, saving time and reducing code. We can do Regular Expression or REGEX validation using Annotations in ASP.NET MVC 5. we can use "RegularExpression" attribute for validation. during this attribute we specify Regular Expression string. We can also specify our custom error messages for that we'd like to set "ErrorMessage" Property in "RegularExpression" attribute. Here is the example for this. We take "Email" Address validation using REGEX. If user enter email address, which isn't in correct format at that time our validation message display on screen. 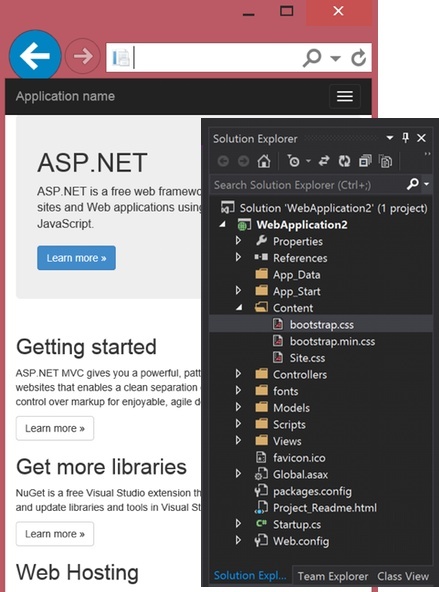 In this article, we will describe about ASP.NET MVC 5 uses Bootstrap 3 as the CSS framework. You can check our last article about asp.net mvc 5 scaffolding. That’s only brief tutorial about ASP.NET MVC 5. We will be back with new tutorial again. 2. We need to ascertain session timeout in action technique. A repetitive code in every action method therefore reduced code reusability and maintainability. Limitation of this approach is that it covers up every action method.Using action filter attribute class of ASP.NET MVC 5. Therefore we will fine tune every controller action as needed. 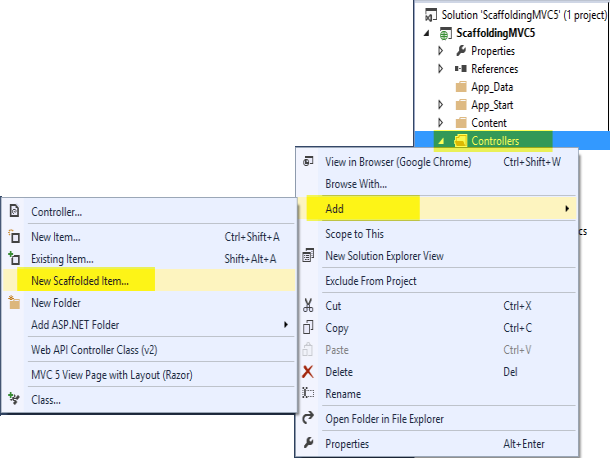 In this article, I will show you how to use Scaffolding With your ASP.net MVC 5 Application. I assume that you all know about scaffolding and I don’t need to explain it again. In our previous post, we have also explained about Scaffolding with the Repository Pattern in ASP.NET MVC 3. 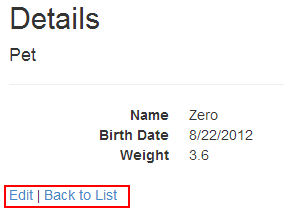 In this article, we will be more focus in adding scaffolded item to ASP.net MVC 5. 1. 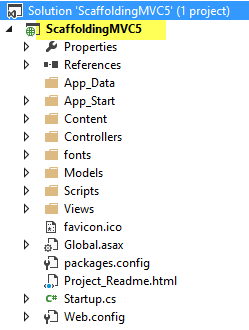 Let's create an ASP.net MVC 5 web application in Visual Studio 2013 and name it as ScaffoldingMVC5. 2. Right click your Controllers folder and Add New Scaffolded Item is as below. 3. 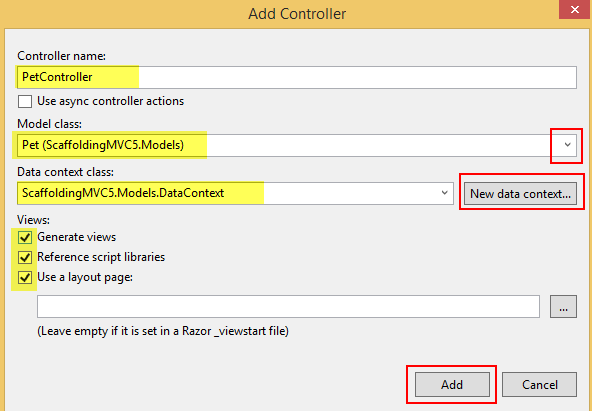 From the Add Scaffold window, select the MVC 5 Controller with views,using Entity Framework scaffold template. All above CRUD operations were generated according to our Model class Pet. [ScaffoldColumn(false)] means,the property which it declared will not use for scaffolding.In other words, that property will not be shown on the UI (i.e. Created property will not be shown). 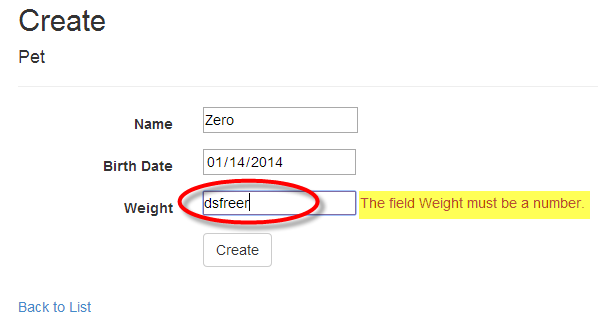 Data validations of the form elements are happening ,according to the above model's Data Annotation values. If you click the Create button, without entering anything.What will happen ? What if you try to enter a wrong data type ? 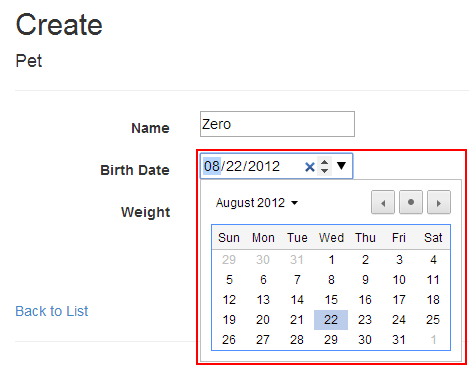 Calender has been shown, if it's a DateTime property. 1. First we need to create a project. Go to Menu File > New > Project > Select ASP.NET MVC web application > Entry Application Name > Click OK.
Open Database and add a table for update operation. Here I am creating a table called Contacts. 3. Add Entity Data Model. Go to Solution Explorer > Right Click on Project Name from Solution Explorer folder > Add > New item > Select ADO.net Entity Data Model under data > Enter model name > Add. 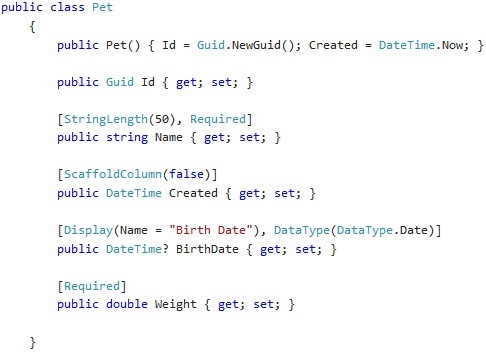 A popup window will come (Entity Data Model Wizard) > Select Generate from database > Next > Chose your data connection > select your database > next > Select tables > enter Model Namespace > Finish. 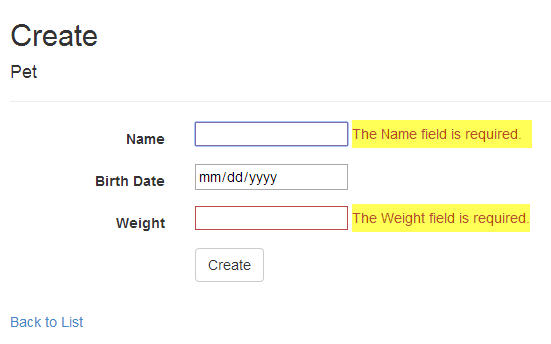 After Creating Data model, we have to modify our generated entity(table) for Apply validation for required fields. Here we need to modify contact.cs fileOpen file and modify as for enable validation. Here I am using Home controller index action. Create View for Update Multiple Row. Code: @Scripts.Render("~/bundles/jqueryval") will enable client side validation. Finally, Run Application. 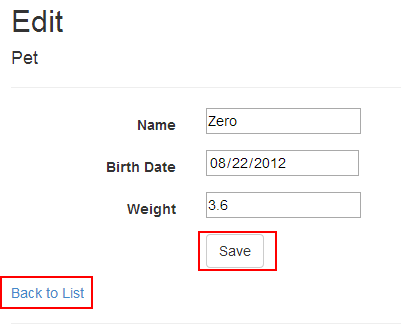 Edit Contact Details and Click Save button.